9. 2.7 l/100 km combined NEDC fuel consumption (per ECE-R101). Technical innovations generate genuine milestones. 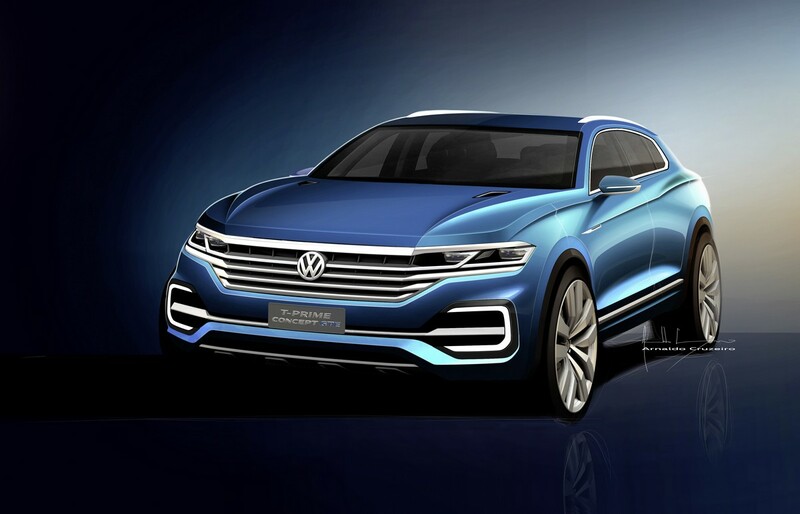 Volkswagen is showing such a milestone in a world premiere at Auto China 2016 in Beijing: the T-Prime Concept GTE concept car. The concept car previews the future Volkswagen SUV. A full-size sport utility vehicle. With a plug-in hybrid powertrain, and all-wheel drive. Zero emissions in the city and on off-road terrain. A contemporary automotive statement; completely redesigned. Volkswagen has integrated the new Curved Interaction Area here as a completely new digital display and control concept. The curved infotainment display that merges with the interactive displays and controls is an innovation. The resulting Curved Interaction Area represents a new human-machine interface (HMI) that is intuitive, precise, fun-to-use and aesthetic. These digital features are part of interior reminiscent of a relaxed living space. The ethos of the T-Prime Concept GTE is that of an ideal and versatile alternative to classic vehicle concepts. This SUV show car combines the best of many automotive worlds: comfortable like a saloon; spacious like an estate; offering traction that is superior to all other types of automobile; based on state-of-the-art chassis technology; agile like a sport saloon and – thanks to innovative drive technologies – efficient like a compact car. SUV offensive by Volkswagen. 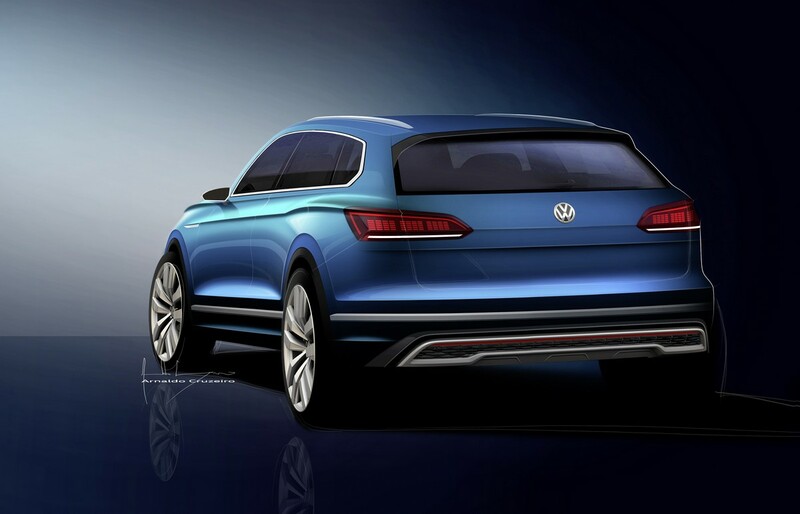 In the future, Volkswagen wants to offer an exciting SUV in every relevant market segment. 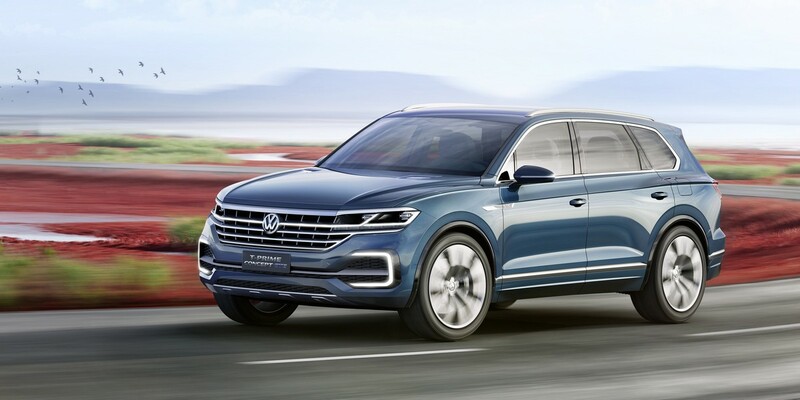 The product campaign starts this spring with the market launch of the new Tiguan which will also be offered with an extended wheelbase in certain overseas markets. 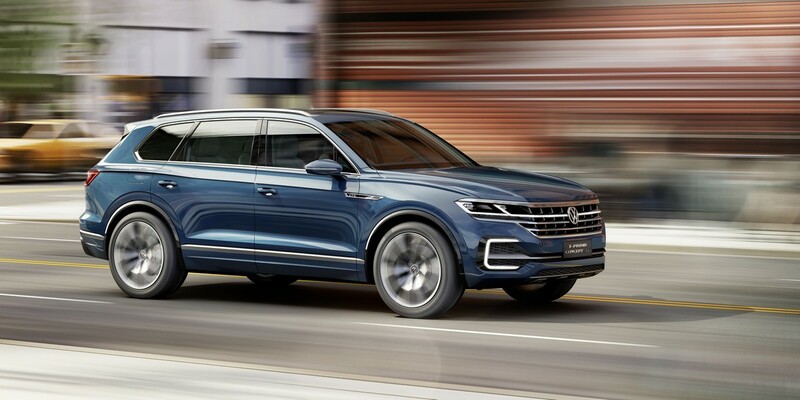 Following in car classes above it are a new mid-size SUV (for the USA and China), the successful Touareg and, respectively, a vehicle in the style of the T-Prime Concept GTE. 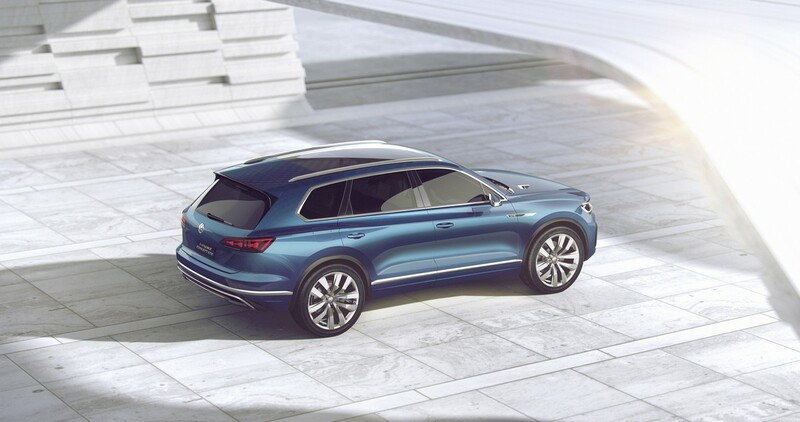 Beneath the Tiguan, two new SUV model series will make their debut simultaneously: in the Golf class, there will be an SUV inspired by the T-Roc concept, and the T-Cross Breeze that was presented in Geneva shows the direction that will be taken in the Polo class (SUV). Two million C-SUVs per year. SUVs are booming – worldwide. And this is especially true in the segment of the large C-SUVs to which the T-Prime Concept GTE belongs. Forecasts for China predict 18 per cent growth between 2017 and 2023; in Europe and Russia growth might even reach 26 per cent. Around the globe, annual volume of the exclusive SUVs will already reach the milestone of two million unit sales around 2020. 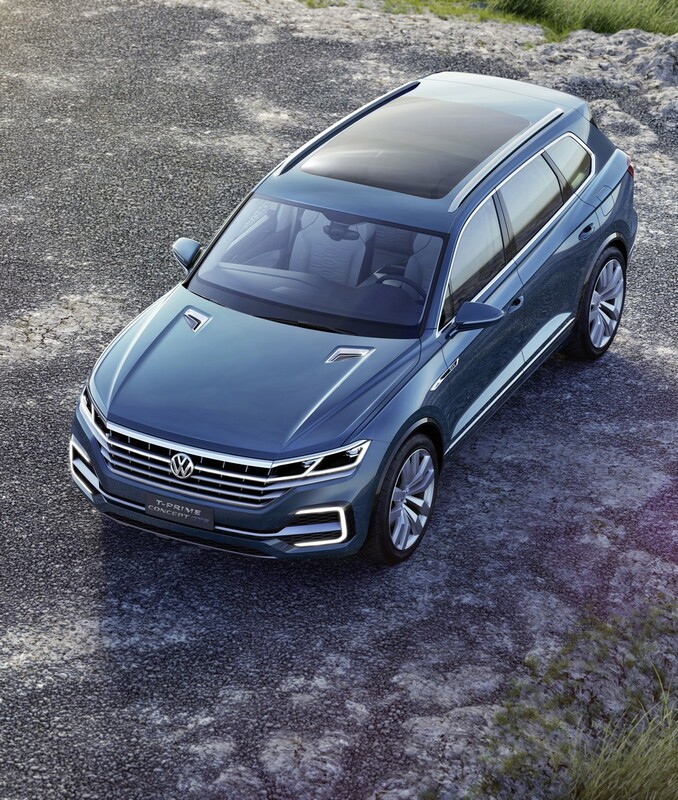 With the new T-Prime Concept GTE, Volkswagen is now responding to this trend by introducing one of the most advanced cars in the world. A masterpiece of technology. The car's display and control elements have been fully digitalised. There are no longer any conventional switches in the interior. In their place come gesture and voice control, touchscreens and touch-sensitive surfaces. Never before has user operation been so easy, intuitive and fascinating – because never before was there a comparable conceptual design or operating aesthetic. At the same time, new assistance systems ensure that driving will be safer. In this SUV, semi-autonomous driving is no longer just a vision. One of the many fitting innovations is the plug-in hybrid drive that is practically silent in its electric E-Mode, and which makes the T-Prime Concept GTE a zero-emission SUV for a distance of up to 50 kilometres. 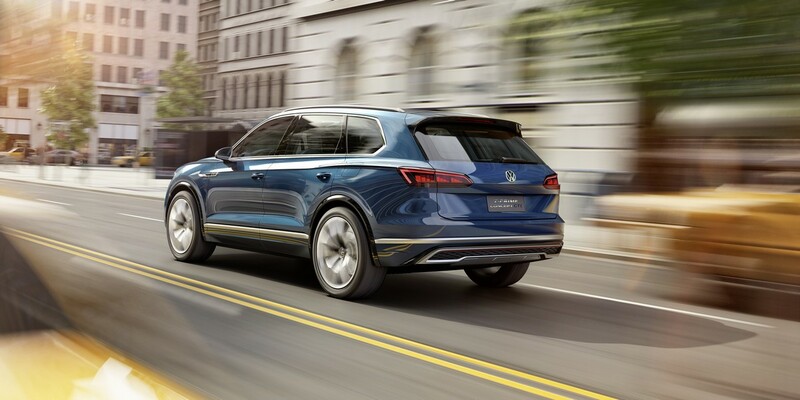 Visually, the innovative technical concept reflects new design dynamics that make the full-size Volkswagen SUV sportier, more elegant, progressive and even more self-confident on the road. Automobile and virtual worlds merge. 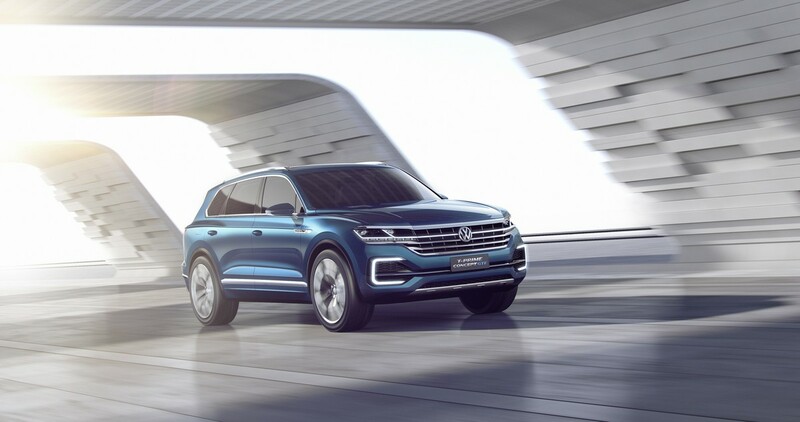 The T-Prime Concept GTE was created under the leadership of Dr Frank Welsch, Member of the Board of Management for Technical Development Volkswagen Brand, and Klaus Bischoff, Head of Design at Volkswagen. "Our team has created a charismatic and sporty all-round vehicle with this SUV, which appeals with its impressive sense of presence and confident poise," says Klaus Bischoff. The concept vehicle's progressive interior reflects the desire for the digital capabilities of a new era. It is, simply speaking, a lot of fun to have a world of displays and controls that consist exclusively of touchscreens, gesture and voice control, touch-sensitive surfaces and shifting "by wire" that can always be used intuitively. The Active Info Display (interactive, digital instruments) and the screen of the infotainment system, which is curved for the first time in a vehicle, meld in the T-Prime Concept GTE to form the Curved Interaction Area – a multifunctional and interactive display landscape. "Very quickly," says Dr Welsch, "this type of human-machine interface could become the norm in the top segment. Progress is immediately apparent here, because the real automobile is melding with the virtual world that is so real today." Meanwhile, an array of assistance systems ensures top levels of safety and convenience in the T-Prime Concept GTE. These systems contain numerous technologies, and they enable such processes as semi-autonomous parking. Plug-in hybrid and all-wheel drive. The concept car is powered by a 280 kW / 381 PS plug-in hybrid drive (electric motor, turbocharged petrol engine, battery charging externally or during the drive). 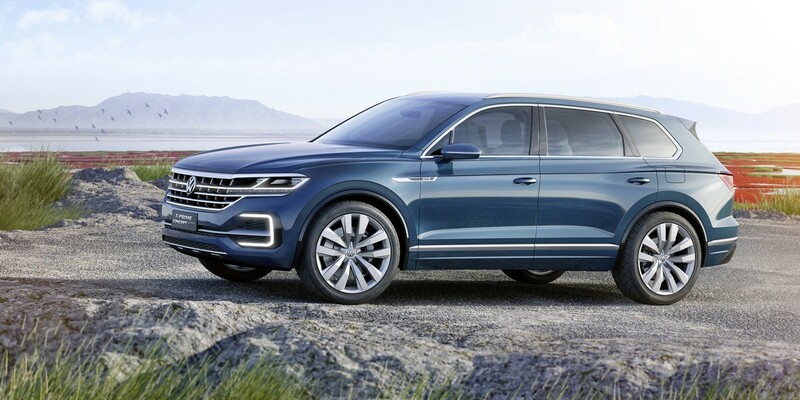 With a sufficiently charged battery (14.1 kWh energy capacity) this SUV – like all Volkswagen GTE cars – always starts in the electric E-Mode. It permits up to 50 kilometres of zero-emission driving in metropolitan areas. In the GTE mode that is typical of Volkswagen plug-in hybrid models, an efficient alliance is formed by the electric motor that is integrated into the housing of the 8-speed automatic gearbox and the 2.0-litre four-cylinder turbo engine (TSI). The electric motor develops a power of 100 kW and a maximum torque of 350 Nm; the TSI has an output of 185 kW and 370 Nm. In GTE mode and during boost (kickdown), the full system power and an impressive 700 Nm of system torque are available. The T-Prime Concept GTE is equipped with 4MOTION permanent all-wheel drive, which distributes power to the front and rear wheels via the limited-slip differential, which is also integrated into the 8-speed automatic gearbox. Fuel economy and driving performance. The impressive fuel economy of the T-Prime Concept GTE shows the way forward. In hybrid operation, such as when the high-voltage battery is flat, fuel consumption is 8.0 l/100 km/h (equates to 187 g/km CO2); in combined mode using energy from the charged battery, the combined fuel consumption in the NEDC cycle for plug-in hybrid models is 2.7 l/100 km (equates to 63 g/km CO2). In GTE mode, the T-Prime Concept GTE accelerates to 100 km/h in 6.0 seconds and has a top speed of 224 km/h. Charging at 3.6 or 7.2 kW. There are two different ways to externally charge the lithium-ion battery of the T-Prime Concept GTE. In the conventional solution, the charging cable is plugged into a 230-volt mains socket. From a completely flat state, the battery would then be fully charged from the mains at a charging power of 3.6 kW alternating current (AC) in eight hours (100 per cent battery charge level). It is also possible to "fuel up" at public charging stations at a power of 7.2 kW. Then the battery is fully charged after just two hours and 30 minutes. Drive modes in detail. The T-Prime Concept GTE can be driven in three different drive modes: E-Mode, Hybrid, and GTE. The system is designed so that the drive utilises battery energy first, and so it starts off in E-Mode. While driving in E-Mode, the driver can intentionally activate the TSI and therefore the Hybrid mode by pressing the accelerator pedal beyond a defined pressure point. The driver can return to the zero-emission E-Mode via touchscreen at any time (provided that the battery still has sufficient charge); in this case, the all-wheel drive is also active. The GTE mode can also be activated via touchscreen. The driver brings out the most agile character of the SUV in this mode. The accelerator pedal, gearbox and steering characteristics are now even more sporty. In GTE mode (and with boost), the TSI and the electric motor also work together as described to access the full system power and maximum system torque. As soon as the driver releases the accelerator pedal, all drive sources are shut off and decoupled from the drivetrain, provided that the battery is sufficiently charged. This is a special form of "coasting". If the driver releases the accelerator pedal or brakes, and the battery is insufficiently charged, the electric motor operates as a generator and feeds the energy recovered from braking into the lithium-ion battery. In this case as well, the TSI is shut off and decoupled. Powerful aesthetics. 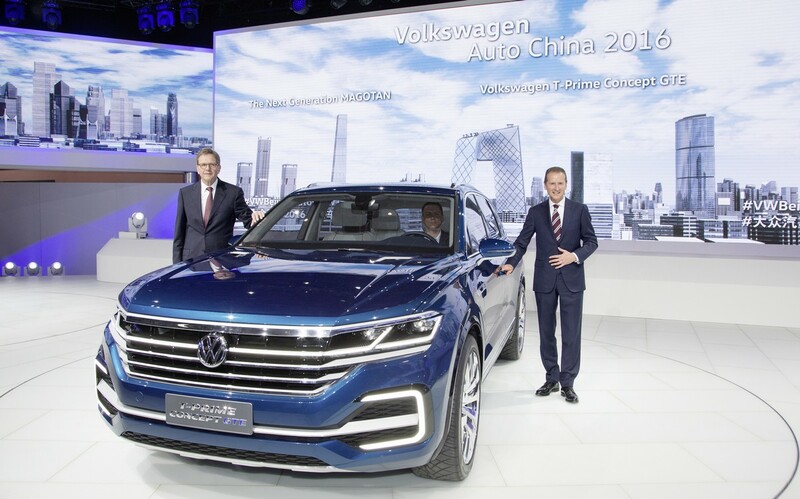 Models like the PHIDEON, which was presented early this year in Geneva and is now making its show debut in China, the charismatic second generation Tiguan and the BUDD-e zero-emission van that attracted international attention, all illustrate just how versatile Volkswagen design is today and will be in the future. 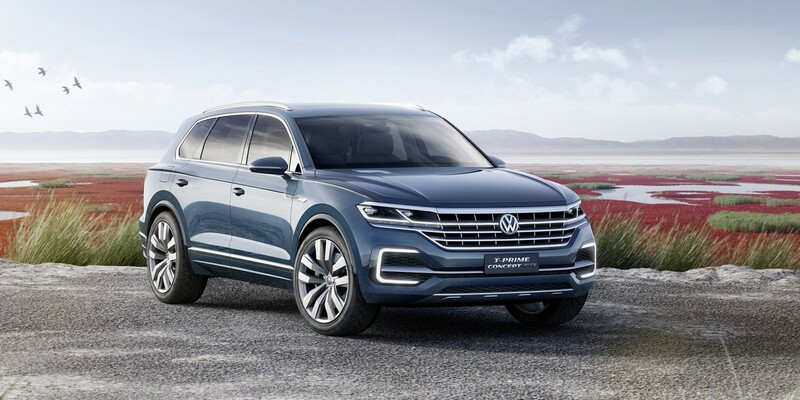 "With the new T-Prime Concept GTE, we are once again showcasing how Volkswagen can ideally master the whole range of differentiation possibilities, even within the individual SUV model series," says Klaus Bischoff. The chief designer continues: "On the one hand, this concept shows the authentic Volkswagen SUV design of the modern era; but at the same time it takes entirely new approaches. A concise example is the chrome radiator grille that extends across the entire width of the front end and integrates the LED headlights. With this impressive 'face' we are creating an entirely new, iconic SUV product sub-brand." Another identifying design feature of future Volkswagen full-size SUVs are the opposing window and character lines. The window line begins in the bonnet and ends in the side window of the D-pillar at the rear. The so-called character line, meanwhile, begins in the rear lights, slices through the rear wheel arches with a razor-sharp undercut (an overhang drawn out from the sheet metal) and ends in the front wing. The two opposing lines lower the SUV's visual centre of gravity and, as in a sports car, they form athletic muscular surfaces over the wheel arches, a clearly identifiable waist and a highly dynamic shoulder section. Klaus Bischoff: "The roof line that descends towards the rear in a sporty style is also striking. This creates an unusually dynamic and yet elegant SUV. The overall radiance of the T-Prime Concept GTE makes it unmistakably clear that it is playing in the top league." Proportions. Technically, the T-Prime Concept GTE is based on the Group's modular longitudinal platform (MLB); it covers full-size models with longitudinally mounted engines and gearboxes. The concept vehicle is 5,069 mm long. 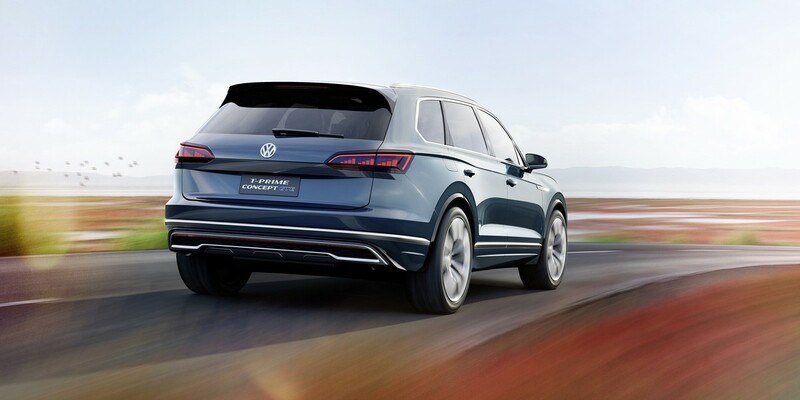 By means of comparison: the SUV is 10 mm longer than the first-generation Phaeton. This Volkswagen, which is equipped with two individual rear seats, has a width of 2,000 mm and is 1,708 mm tall. Balanced proportions, a very dynamic silhouette and an athletically tensed body with pronounced shoulders together create an entirely new SUV dynamic. Front end. Making an exceptionally self-confident appearance is the front end described previously by Klaus Bischoff. The large chrome radiator grille merges with the headlights and extends across the entire width of the body, which gives the T-Prime Concept GTE its unmistakable charisma. Typical of all Volkswagen plug-in hybrid and electric models are the c-shaped daytime running lights in the front bumper. Side profile. The vehicle's side profile displays sporty proportions with a long, extended bonnet and a matching extremely long roof section. Also defining its style, as mentioned, are the opposing window and character lines and the flared wheel arches. The latter are filled out with large 22-inch alloy wheels and size 285/40 tyres. Rear. The wide rear shoulders of the T-Prime Concept GTE, between which the "greenhouse" tapers towards the rear, form a sporty rear end with maximum presence. The thin LED rear lights underscore the impressive overall width. The horizontally aligned rear has a clean and organised layout. Form follows function. The tailgate extends far into the bumper, which creates a low load sill. Four-seat concept with a relaxed living space. Anyone looking through the windows into the closed T-Prime Concept GTE discovers one aspect above all else: sporty and stylish elegance and the horizontal orientation of its surfaces. A closer look reveals a mix of cool aluminium (surrounds, door handles), blue leather (upper part of dashboard, door panels, steering wheel rim) and glossy-black surfaces (wing-shaped front side of dashboard, centre console, door accents and multifunction switch arrays on steering wheel). Forming a contrast are the warm colour hues of the wood accents (wrapping around the dashboard and doors, propshaft tunnel trim) and other leather surfaces (seats, trims beneath wood accents). The interior is transformed into a mobile living space in its interplay of colours and materials, perfected ergonomics (including individual seats in the rear as well) and a new operating aesthetic. 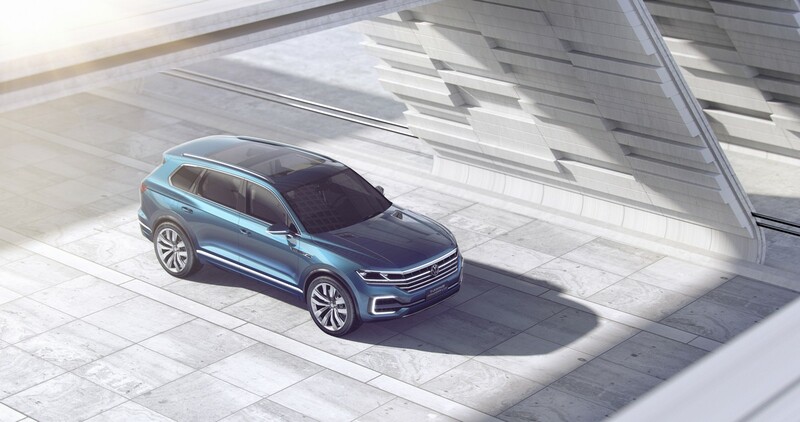 In the T-Prime Concept GTE Volkswagen is presenting a living automotive world whose atmosphere matches that of the connected, progressive, personal residential environment. New world of displays and controls. As soon as a door of the SUV concept is opened, the variety of functions of the digital interior reveals itself. The team of designers and engineers behind the car have exploited an opportunity to create an entirely new concept of vehicle and infotainment control in the T-Prime Concept GTE. It does entirely without conventional switches. With the exception of the steering wheel stalks, all other controls are implemented as touch-sensitive surfaces with white backlighting or – in the case of gearbox control – have been engineered to be completely new "by-wire solutions". A key feature of user operation is gesture control. Proximity sensors and voice control are also used throughout the vehicle. Curved Interaction Area. Forming one visual and functional unit are the Active Info Display (digitalised instruments) and the infotainment display (head unit); the head unit is slightly curved – a world first in a vehicle – and is aligned towards the driver for optimal ergonomics. The Active Info Display and head unit are located under a continuous, elegant glass surface and merge there to form the newly developed Curved Interaction Area. Spanning the area in front of the driver like an arc is the Curved Interaction Area which impressively symbolises the cockpit of the future. A future that will begin at Volkswagen as early as in 2017. Active Info Display. The new Active Info Display of the T-Prime Concept GTE has a 12.0-inch diagonal. All indicators are virtually implemented in software – such as the power meter that is typical of a Volkswagen with a plug-in hybrid drive and, of course, the speedometer. In the middle, between these two round instruments, all imaginable information can be shown by thematic tiles (apps) – e.g. information that can only be displayed via the infotainment system when analogue instruments are implemented. In Navigation mode, for instance, a 3D map display can be shown. Here the power meter and speedometer are relocated to the sides to make more room for the map display. Information such as navigation and assistance functions, telephone contact images or the coverflow of the media library may be shown, depending on what is needed. Infotainment system. The curved homescreen of the 15.0-inch head unit can be configured by the driver or front passenger. Here, three thematic tiles (apps) can be freely arranged on a defined screen grid or can be bundled. Users can fill a large main screen area with a wide variety of contents or menu levels, such as two smaller thematic sub-areas (apps). Contents that might be shown here include the media library, weather data, voice mails or navigation instructions. In exactly the same way, the individual thematic tiles of the Active Info Display can be configured in the head unit first, and can then be moved to the digital instruments by a swiping motion. This is a new technological and intuitive type of user operation that is simply fun to use. The user can always press a home button located low and at the middle of the head unit to return to the top menu level from any other menu. To the left and right of the home button are capacitive control surfaces for climate control and for seat heating and seat ventilation. As described, the curved head unit and Active Info Display have been merged under a common sheet of glass to form a Curved Interaction Area – a new interactive and multifunctional display that will revolutionise display and control possibilities. New by-wire controls. Revolutionary features of the T-Prime Concept GTE include "by wire" control of the gear shift unit for the 8-speed automatic gearbox on the centre console. This is implemented as an elegantly designed glass scroll wheel with a chrome surround that is fitted with sensors which enable intuitive operation of functions. Located in front of this glass scroll wheel is a display with a virtual scroll wheel – as soon as the driver operates the real roller, the roller in the display turns accordingly. Implemented as touch-sensitive surfaces are the controls around the glass scroll wheel for the hazard warning lights, the Auto Hold function, starting and stopping the engine (Keyless Go) and the electric parking brake. Multifunction steering wheel 3.0. Another highlight is the multifunction steering wheel without switches. The smooth surface of the multifunctional areas use touch feedback. The individual functions are activated by pressure or with a swipe gesture. When the surfaces are touched, the driver of the T-Prime Concept GTE gets touch feedback, or "pre-sensing", which lets the driver locate the function. As soon as the driver activates the function, the control gives stronger tactile feedback. This makes operation more intuitive than solutions implemented in today's production cars. Unlike known systems, operation is also not limited to a usual rocker switch, rather it is possible over the entire surface of the control island. Displays at the rear too. A 9.6-inch display surface is also located between the two individual seats in the lounge-like rear seating area; it was integrated in the continuous surface of the centre console. From here, users can adjust climate controls and seat adjustments using touch-sensitive surfaces. A tablet (10.1-inch) snaps onto each backrest of the front seats. These tablets let rear passengers access all conceivable media library functions. Water, earth, wood, metal, fire. These five elements are inseparably intertwined in Chinese lifestyle. Each of them is interrelated. The colour and materials concept of the T-Prime concept GTE is based on these elements, in tribute to China. Water. Water, the all-dissolving and flowing element is reflected in the petrol-blue body paint colour "Beihai Blue" (a beach on the South China Sea). Xirallic® – a cyan-coloured substance with crystal effect pigments – makes the paint sparkle when viewed from above; meanwhile a dark deep sea blue is seen on the edges. The instrument panel and the back sides of the seats carry the exterior colour scheme over into the interior with the turquoise blue leather colour "Ipanema Blue". The seats themselves are finished in the colour "Mistral". Earth. The earth is a solid element that brings everything into balance; leather and Alcantara in the light-grey contrasting colour "Mistral" create a visual effect of earth in the interior. Wood. Wood is created by combining earth and water. Open-pored wood accents in "Walnut Trunk" make it possible to visually experience this natural material very intensely. Metal. Cool metal as a shaping external force can be found in the aluminium accents, both exterior and interior: polished and satined. Fire. The burning element of fire sets the scene; Volkswagen uses the look of fire for the leather piping (piping between the leather surfaces) of the seats in the colour "Himalayan Brown".